Urbanization is a complex spatial phenomenon involving significant compositions and interactions in land use. Yet, only few studies have quantitatively examined multidimensional urban land-use patterns with insights into land use policy, particularly in the context of China’s rapid urbanization process. 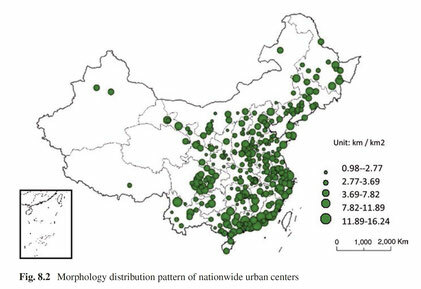 This paper aims to investigate the urban land-use patterns in China by employing multiple measurements with multi-sourced data, including Spatial Entropy and Dissimilarity Index, and a combination of cellular-automata (CA) modeling and Structural Equation Modeling (SEM). 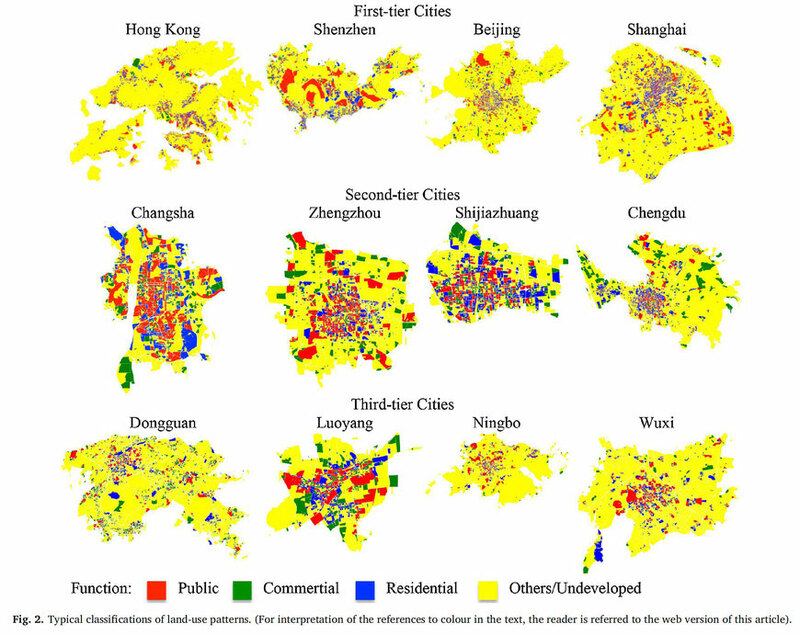 The results show that land-use patterns in China are characterized from more mixed (Beijing, Shanghai) to less segregated (Xiangyang, Tangshan, and Guiyang), and the most segregated (Chongqing), which can be categorized into three typical types: economically led, government led, and geographically constrained. The findings also indicate that residential sector has correlation with GDP and urban built-up area; public sector is driven by GDP, urban built-up area, and paved road area; and commercial sector is related to GDP and paved road area. Furthermore, land-use patterns are not only determined by economic forces, but also subject to China’s land policies that formulated based on its unique social and political characteristics. It reveals the complex spatial characterization of urbanization in China, where government still plays an important role in facilitating the land use allocation. The research sheds light on understanding land use policy for land-use patterns reconfiguration in the context of New-Type Urbanization towards better planning and governance. evaluating the identified nationwide urban centers using various types of open data from four dimensions, respectively. These dimensions range from scale, morphology, function, to vitality aspects, thus providing opportunities for exploring the overall development characteristics of nationwide urban centers. We hope this chapter may shed light on future urban studies on urban centers of China. This paper redefines urban center based on the activities which are carried out through Internet, and identifies all urban centers of 658 cities utilizing Baidu heatmap. We take the new method of recognizing urban centers as a bottom-up pattern which will assist the traditional top-down method. Among 658 cities, there are 69 polycentric cities; and we focus on them to explore the general law of Chinese polycentric cities. All polycentric cities are classified into three categories according to the number of urban centers, which are primary polycentric city, growing polycentric city, and mature polycentric city. We further analyze areas, average distance and activity intensity of all polycentric cities on the basis of these three categories. According to our analysis, Chinese big cities perform significant polycentric city, while development of small cities (especially county-level city) are extremely lagging. Disparities among all polycentric cities in areas of centers are huge; Generally, they all tend to develop a hierarchical structure. As the polycentric cities keep developing from primary level to mature level, the communication distance will increase gradually, but the improvement of centers to city dynamic is also remarkable. At last, the regression analysis indicates that the number of employment and GDP per capita have significant correlation with the formation and development of urban centers. 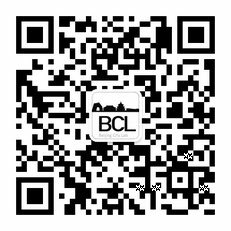 Accordingly, we provide three suggestions for Chinese cities regarding to the importance of developing center, the efficiency of centers’ network, and the new method of identifying centers. The live-work-play (LWP) center, as a more comprehensive profile of a city center, has attracted increasing attention in recent years. In this paper, we propose a straightforward framework to identify and evaluate LWP centers by using ubiquitously available points of interest (POIs), a proxy of urban function. The framework is then applied for 285 Chinese cities. 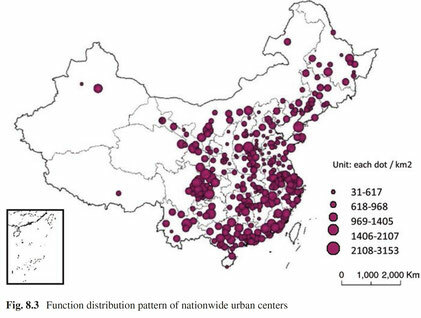 The results show that 35 Chinese cities in 2014 are associated with polycentric urban structure and 23 in 2009. The temporal evolution of LWP centers of Chinese cities concluded on the basis of multi-year identification could be summarized as three types of evolution in view of LWP center number, morphology and location as follows. First, more polycentric cities emerge in 2014 in comparison with those in 2009. Second, the morphological change type can be further classified as “relative dispersion”, “relative concentration”, and “absolute concentration”. Third, the location change type can be classified as five types-displacement, division, fusion, emerging, and recession. In the last experiment, the regression results show that the larger population and greater road junction density significantly contribute to the LWP center formation.